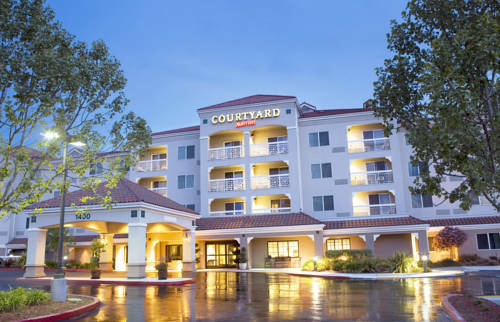 Travel for work or leisure and kick back in comfort at Courtyard Novato Marin/Sonoma. Lounge in the privacy of our modern accommodations featuring comfortable beds and ample seating. Ergonomic workspaces, free Wi-Fi and a view of your surroundings enhance your stay at our hotel. Be sure to drop by our on-site eatery, The Bistro - Eat. Drink. Connect. , and grab yourself a healthy and hearty meal. Pair your entree with a cup of Starbucks coffee in the morning and a refreshing cocktail in the evening. In your free time, break a sweat with a brisk workout at our hotel fitness center featuring an adjustable bench, free weights and several cardio machines. Then work on your tan under the California sun at our refreshing outdoor pool. Taste the flavor of the famous California Wine Country located in Sonoma and Napa Valley, just moments from our hotel. Also nearby are the Muir Woods National Monument and Infineon Raceway. Whatever the reason you find yourself in Northern California, come and feel right at home.